These Sour Cream Steak Enchiladas turned out amazing, we have a new family favourite! 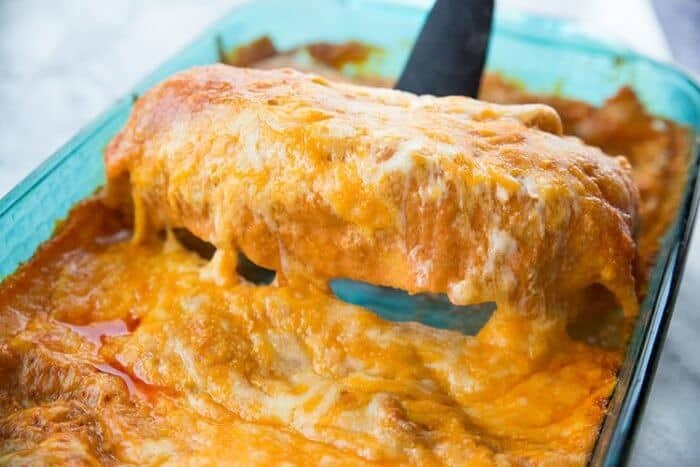 How to Make Steak Sour Cream Enchiladas With the Best Sauce! I have found the perfect sauce for steak sour cream enchiladas you guys, no word of a lie. 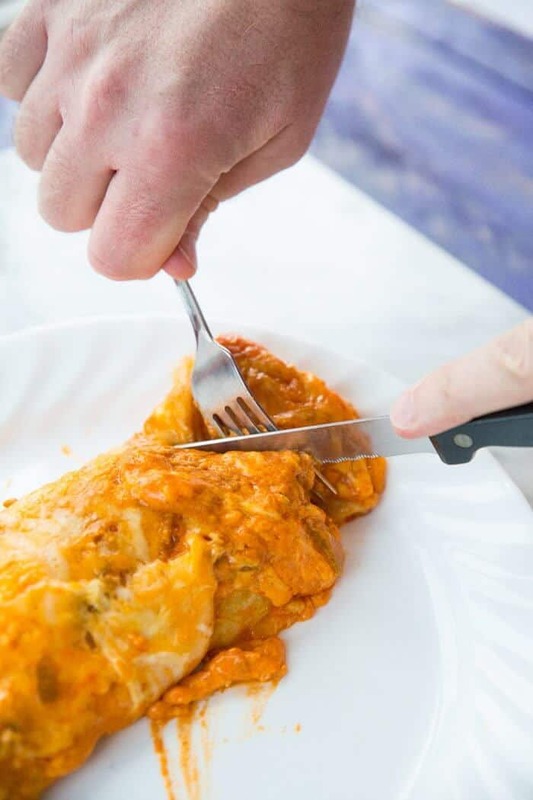 It’s different from what you’re used to seeing – and I might spice up the normal white sauce that you are used to for sour cream enchiladas and give it a whirl- but for now you simply must try this recipe, and soon! 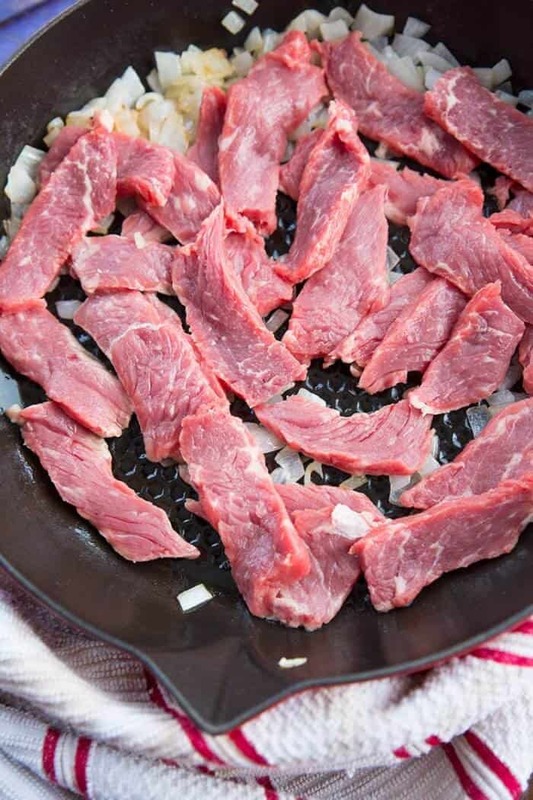 You probably wouldn’t think about using a really good steak in sour cream steak enchiladas, the reason being that most people would think that you should buy cheap, tough steaks. That’s absolutely the worst thing you could possibly do in this dish. There is a misconception about Mexican food that it has to be cheap – and nothing is farther from the truth in an excellent Mexican restaurant. You will see flank or skirt steak on the menu more often than not, which was my inspiration for using striploin steak in these enchiladas. Why not use good steak in a decadent enchilada meal? This recipe uses two steaks and feeds four people – that’s much better than one steak per person! Also – cheese. Steak and cheese are match made in heaven. You fry up the onions – I put more in the adults and if you are daring I would do larger lengths of onions and fry them until they are super soft. This is the only chance that you get to cook the onions until they are soft! Don’t think that they will cook in the oven because they won’t, trust me on this! You want to cook the steak until it is just done, no more. You don’t want to destroy all of that lovely marbling because if you cut across the grain that beef is going to melt in your mouth. The sauce is the best part! You can use more green chiles if you really love them! Use good steak! Here is a Guide To Choosing The Best Steak Cut. Let’s talk about the sauce. Most sour cream enchiladas are sour cream, chicken broth and green chiles. That really is too bland for me so I really had to think about spicing it up.So I bought enchilada sauce, mixed it with sour cream and the green chiles and magic happened. Everyone raved about the sauce. When my son was being my hand model for the sauce pouring photo he took a spoon and cleaned out the measuring cup when he was done! He could hardly wait until this was baked up in the oven after tasting the sauce. Using the sour cream mellowed out the enchilada sauce until it was a velvety, thick sauce with little bursts of heat from the green chiles. And how did the steak strips fare inside, you might wonder? Perfectly. This is the reason why you want to use a good steak in enchiladas. You aren’t going to have to saw through them like you would when you use a tough meat. These were utter perfection using the striploin steaks and I won’t be using another other type! Use great steak and you won’t have chewy enchiladas. Enchilada sauce is the BOMB DIGGETY. You guys, I can’t wait to make more enchiladas using the sour cream and enchilada sauce mixture! Green chilies are my new best friend and are a match made in heaven with sour cream. I knew this before as when I was pregnant with my firstborn I literally ate jalapenos dipped in sour cream. And we wonder why he loves spicy food…. These are going into the regular rotation from now on! Pin This To Your Dinner Recipe Board and Remember to FOLLOW ME ON PINTEREST! 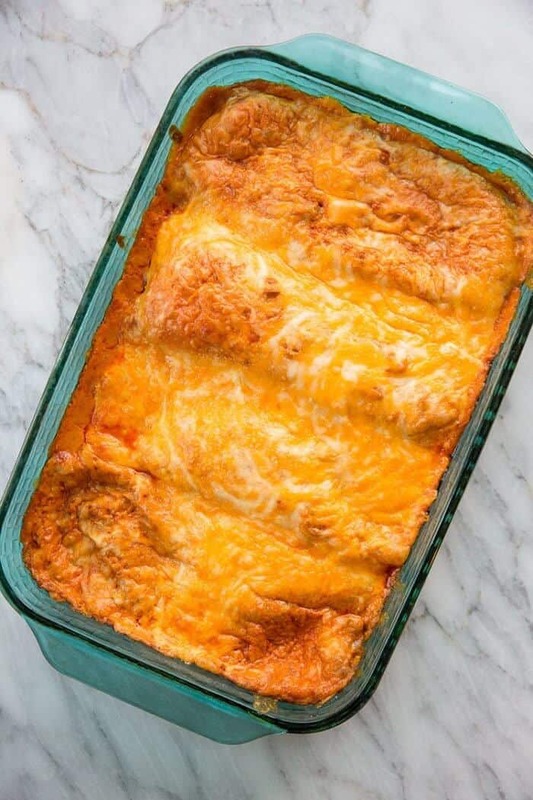 These Steak Sour Cream Enchiladas are the easiest dinner ever! The whole family is going to love them! In a large skillet over medium-high heat, add the oil and onions, then stir. Fry until the onions are soft and translucent. Add in the beef and stir fry quickly until browned, trying not to overcook. Salt and pepper the mixture slightly, then remove from the heat. Take the tortillas and lay them flat. Divide the beef mixture between the 4 tortillas evenly, placing the beef in the middle of each in a line. 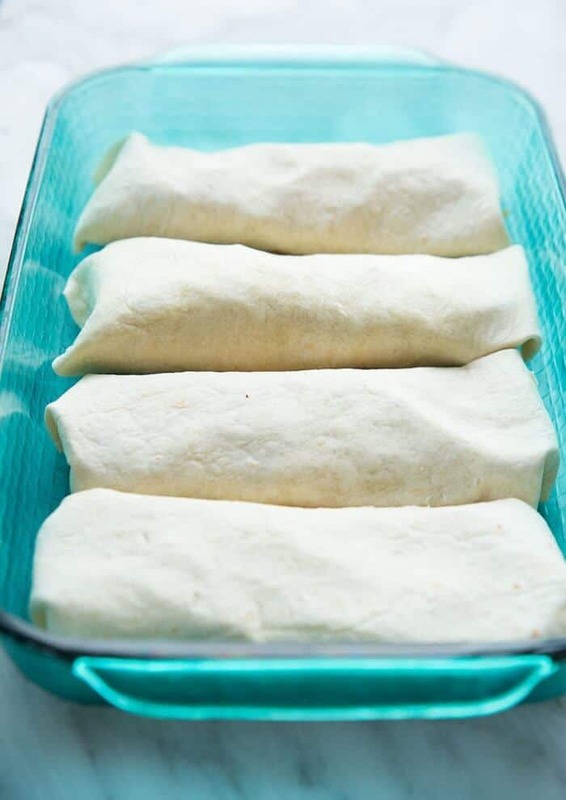 Sprinkle 1/4 cup of cheese on top of the beef in each tortilla, then roll the tortilla up like a wrap. Place seam side down in a 9x13 pan as shown in the photo. In a medium sauce pan, combine the enchilada sauce, sour cream, chiles and cornstarch. Whisk until the cornstarch is mixed in completely. Heat the sauce, stirring continuously, until steaming hot but not boiling. 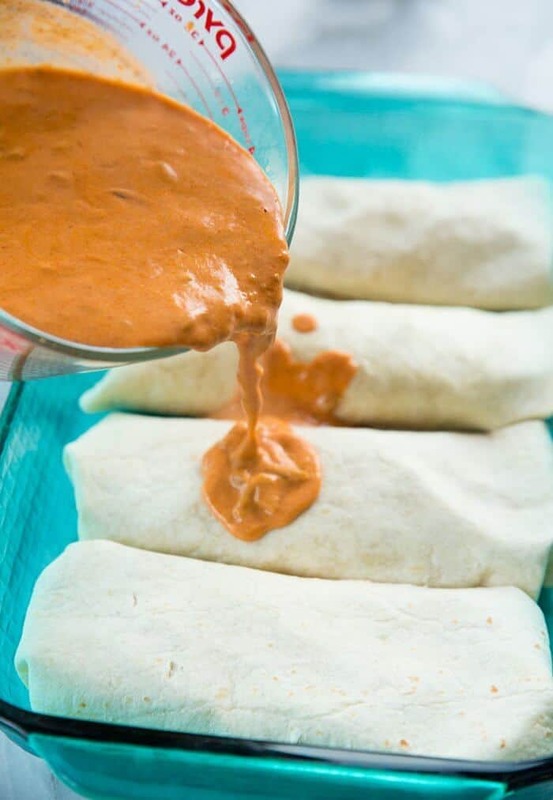 Pour the sauce over the wrapped tortillas in the pan, coating each evenly. Sprinkle the remaining cheese in an even layer on top. 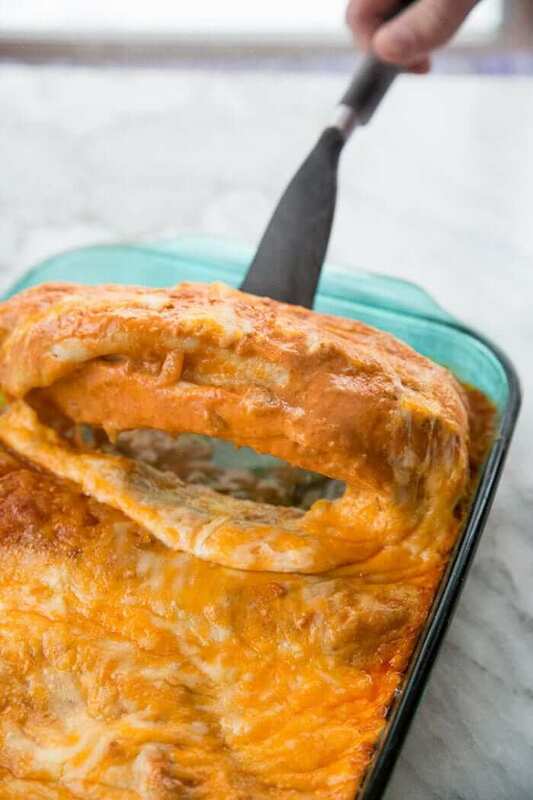 Bake in the oven for 18-22 minutes or until the cheese is melted and the sauce is bubbling. This recipe was great, the sauce was unbelievable. It’s more work than I’m used to doing in the kitchen, but so worth the effort. Thank you very much for sharing this with us. I came across this an we love it. I made a few changes I used the green chilie sauce instead of red. I didn’t have any cornstarch so I put a big glob of the queso cheese. its a quick easy meal an everyone keeps asking to have it again. I didn’t figure leftovers would be good but they was amazing still.